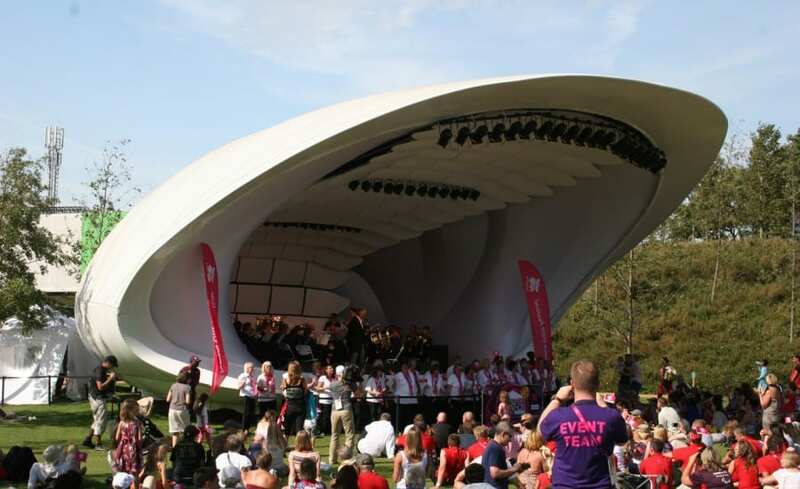 The worlds first mobile acoustic performance area has been created by new London Company Soundforms Plc, with internationally renowned tensile fabric contractors Architen Landrell providing the fabric skin. 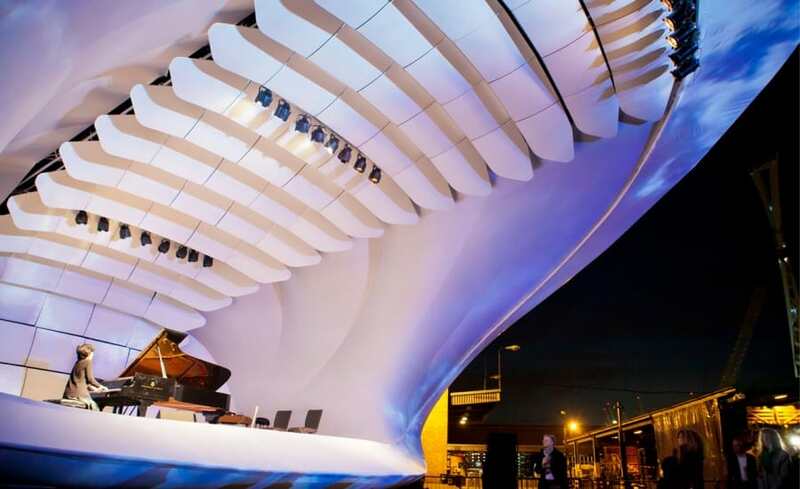 The idea of an outdoor structure that could be placed in any environment without having effect on the acoustics was the brainchild of world famous conductor Mark Stephenson, who enlisted the assistance of Arup Acoustics and ES Global to create his dream. 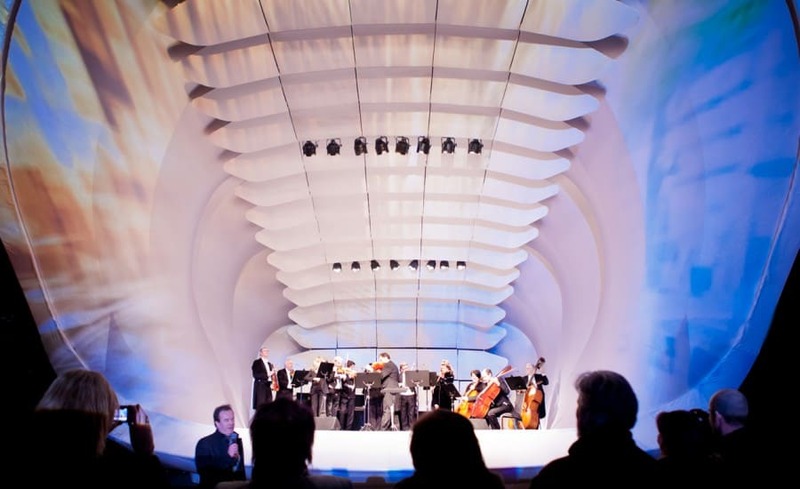 Arup Acoustics worked with Mark to create an initial design for the internal shell which meant that the music would sound the same anywhere in the world. The Architen Landrell team comprised of Josie Britton who project managed the project, Ceri Richards senior designer and Lance Rowell and Alex Heslop who worked as technical consultants. 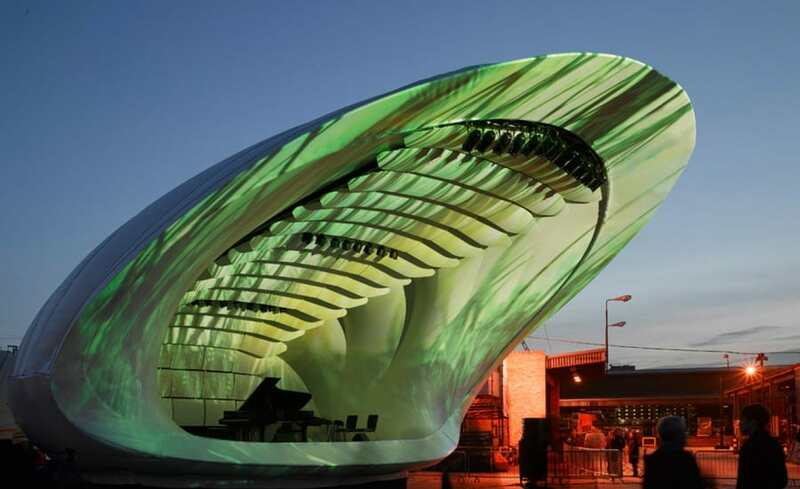 The external fabric skin membrane was made out of white PVC coated polyester and internally the fabric was black to prevent reflection, the roof system comprised of several timber acoustic baffles. The inner cheeks of the structure (which form the sides of the shell) were made out of joelastic white fabric with a slight shimmer to it. The aluminium for the structure was created by TSG with the hard work of Malcom Richards from the company. The fabric skin was designed to be easily erected similar to a childs pram cover, with little or no heavy plant assistance. The Architen Landrell design team accomplished this and produced a cover that requires very limited plant to erect up the fabric. The logistics and assembly of the structure is being undertaken by ES Global services who kindly hosted the launch at their base in London. They will be in charge of all future logistics and assembly of the performance structures. Architen Landrell project manager Josie Britton is Very proud of the final fabric skin, for such a challenging unique project the end result is beautiful. All teams involved worked arduously and meticulously to ensure everything went to plan and I look forwards to being involved in Soundforms Mark 2! Senior Designer Ceri Richards thoroughly enjoyed working on such an exciting and innovative design, the final skin is unique and amazing! Im proud to have played such an integral role in the design process.